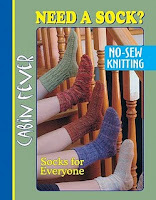 Do you have your new copy of the Cabin Fever- "Need A Sock" book yet? We have sold our first lot of books and our second dozen copies will be in the shop on Wednesday Oct 6th @10am. Our very own Brenda Harris has co-authored this book with Deb Gemmell.